The European Union has set up a system to recognize and protect agricultural products (such as wine, cheese, olives, hams, and so forth) that come from specific places so that companies in other places can’t make products with the same name and thus confuse consumers. Wines from all the classic wine regions of E.U. member countries (France, Italy, Spain, Germany, and so forth) are covered under this system. When you see the label of a European wine that’s from a recognized, protected place, you’ll find a phrase to that effect. Protected Designation of Origin (PDO), for the most regulated wines. Protected Geographic Indication (PGI), for the less regulated wines from registered regions. In theory, every bottle of European wine — except for the most broadly sourced, least expensive wines — carries one of these two phrases on its label. But in practice, the situation is much more complicated, especially at the moment. How? For one thing, each country can, and does, translate the words Protected Designation of Origin and Protected Geographic Indication into its own language on its labels. Second, because these E.U. designations went into full effect only in 2012, many wine labels still carry the phrases that were previously used by each country to designate a wine’s category of origin. And finally, each country can permit its wineries to continue using the former phrases rather than the new phrases. 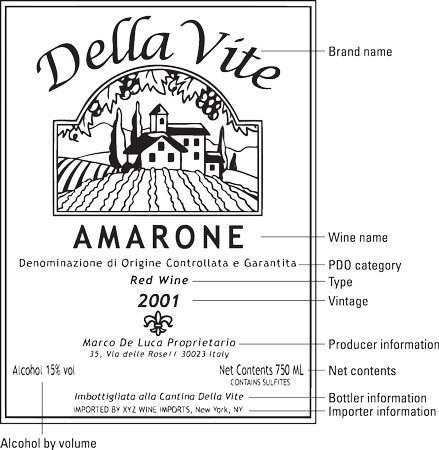 If you’re getting into French, Italian, or other European wines and see a long, foreign phrase on the label that’s adjacent to the place-name or region of the wine, know that it indicates an officially protected geographic zone. Incidentally, the phrase for a registered place-name in the United States is American Viticultural Area (AVA). But the phrase doesn’t appear on wine labels. Nor does any such phrase appear on labels of Australian or South American wines. Nor do two different degrees of regulations exist, as they do in the European Union. 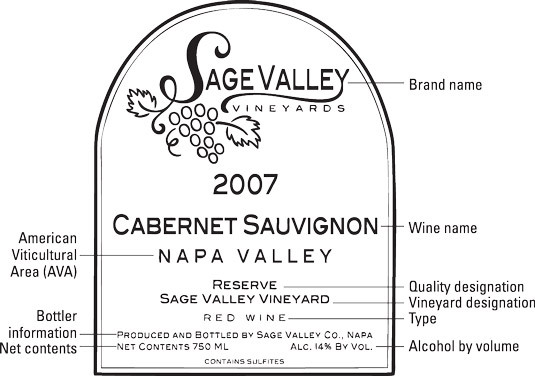 The label of an American varietal wine. Here is a European wine label as it would appear in the United States, using the original place-name terminology. The label of a European wine to be sold in the United States.